Obligatory mention of how long it has been since I posted. Moving on! Hello, loyal and long-neglected readers! Thanks for coming back to… well, to read. My friends are awesome, and as such I like to take super good care of them when they come over to visit. Bassvocals graced us with his lanky presence for the weekend, and so I got up early and threw together some breakfast for he and Shiny Roommate, and I decided on French toast. French toast is a really easy throw-together breakfast as long as you have some simple ingredients. 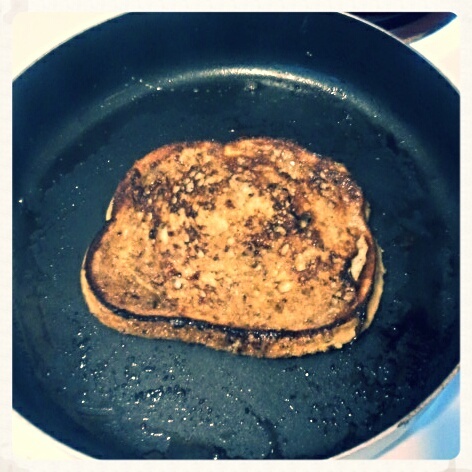 However, the BEST French toast you have ever made in your entire LIFE takes a couple extras. The below makes at least eight pieces… Let us examine. Step 1: The secret to frying anything is making sure you fry it in a delicious fat. As such, melt your stick of butter in your microwave safe bowl. Step 2: Once your butter is melted, mix in some brown sugar— just enough so that it all dissolves all the way, I think I used like 1/8 cup, maybe a little more. Add cinnamon as well, maybe two tablespoons. Step 3: Take up your mighty fork and beat your 6 eggs in your large mixing bowl. Add some cinnamon, enough that you have a cinnamon swirl in your eggy mixture when you stir it all up. Add a splash of vanilla, and make sure it’s all mixed up nicely. Step 4: Add two tablespoons of your butter mixture to your frying pan and turn the heat on medium. 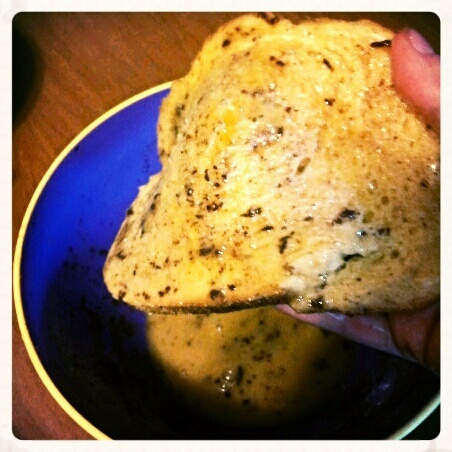 Step 5: Dip a slice of your bread into your eggy mixture, making sure that both sides are coated. I usually run my fingers over it a few times to make sure that there isn’t too much egg left on it, or else it gets a weird consistency. This is what your bread will probably look like when you dip it in the eggy stuff. Step 6: Place your eggy bread carefully into your frying pan. If there is room for another slice, repeat steps 5 and 6. If there is still room because you’re using like a mondo skillet or something, continue adding as many slices as will fit without touching, but no more than you can monitor. If you need to, add more of your sugary butter mixture. This is the uncooked side of the bread. Woo! Step 7: Once the eggy mixture starts bubbling on the top of your bread slice(s), count to 30 and then use your spatula to flip the bread slice over. Monitor and make sure that the bread cooks thoroughly, but doesn’t burn. Once it’s no longer floppy and soggy, you are in the clear, so just cook each slice until it is as crispy as you want it. 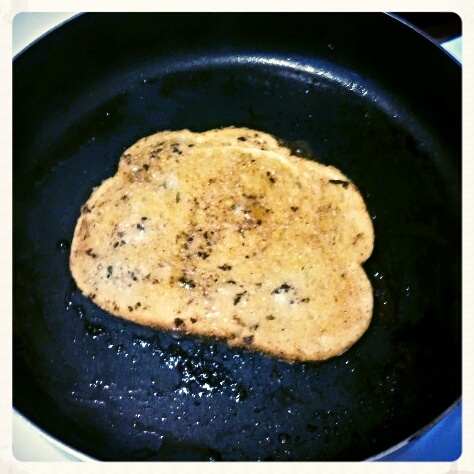 When you flip your bread, it should look something like this. Don’t worry if it’s darker– sometimes the cinnamon settles and makes it look all burnified. Step 8: Take slice(s) out of pan when finished and repeat steps 5-7 until you run out of bread slices (or eggy mixture). Serve warm if possible. Voila. Dig in, and don’t forget to tell us how yours turned out! Pro tip: If you serve the rest of your sugary butter mixture on the French toast instead of syrup, you may exact a marriage proposal from whomever eats it. I served mine with fruit salad and sausage links. Thanks for reading, and as always please remember to comment/like/share/subscribe! Also make sure to try these things out and come back to let us know how they turned out for you. 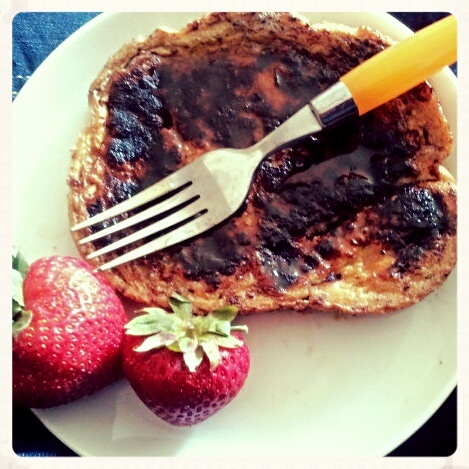 Posted on June 30, 2013 by Miss Molly Stewart	• This entry was posted in Breakfast!, Recipes! and tagged breakfast, budget, cheap, cinnamon, delicious, food, french toast, recipe. Bookmark the permalink.